The sun came out to show you some of this holo goodness! So what do you think?? 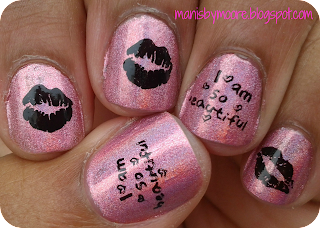 The I am so beautiful stamp reminded me of a part on the movie where Regina asked Lindsay Lohan if she thought she was pretty. I used kiss stamps from two different plates because my nail beds are super small and I could not fit the Cheeky kiss stamp on my pinkie. What is your favorite Lindsay Lohan movie?? Thanks for stopping by! I like that movie too - like the interpretation on your nails! I LOVE THIS! So holo, so girly, so "beautiful"! I LOVE HOLOS!! I am trying to perserve them because I wear them a lot! !